Interstate 475 (unsigned Georgia 408) is a six-lane bypass for I-75 to the west of Macon in central Georgia. The freeway allows long distance travelers between Atlanta and Florida with an alternative to the in-city route of Interstate 75 through Macon. As such, a rest area lines the northbound lanes ahead of Exit 9. Interstate 475 remained the through route for I-75 in the Macon area in 1970. 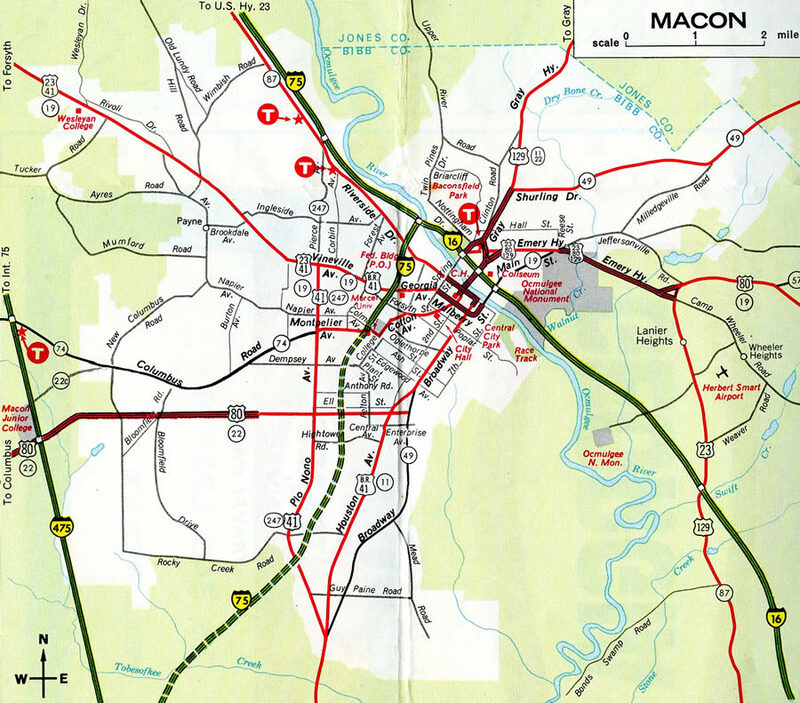 Interstate 75 to the west of Downtown Macon opened to traffic in mid 1969. Interstate 475 enters a folded diamond interchange (Exit 15) with U.S. 41 by the community of Bolingbroke. The freeway defaults onto I-75 north just to the north. Photo taken 10/22/15. Similar to the southern terminus, the north wye interchange with Interstate 75 sees a pair of end shields for I-475. The left-hand merge brings Interstate 75 up to four northbound lanes to the Rumble Road off-ramp (Exit 181). Photo taken 10/22/15. The initial sign for Interstate 475 references the bypass aspect of the freeway to Valdosta. The south Georgia city lies 156 miles ahead. Photo taken 05/29/05. Interstate 75 south to Interstate 16 connects Atlanta with Savannah and its Port, the Gold Coast, and Jacksonville, Florida. Photo taken 08/07/13. Two lanes serve both Interstate 75 south into Macon and Interstate 475 south to Perry, Cordele, Tifton and Valdosta. Photo taken 08/07/13. Long distance travelers bound for Florida via I-475 will reach the Tampa and St. Petersburg area in 376 miles. Downtown Macon is a 14 mile drive via either I-75 south or I-16 east. Photo taken 08/07/13. The two-mile sign for I-475 was replaced and elevated between 2003 and 2005. Photo taken by Chris Patriarca (07/06/03). This supplemental guide sign for Interstate 475 was replaced by 2007 with a new sign bridge near the Pea Ridge Road overpass. Photo taken 05/29/05. A begin Interstate 475 shield stands just beyond the Exit 177 gore point. Begin shields are posted sporadically across the country. Other examples can be found on Interstates 185, 520 and 675 in Georgia. Photo taken 05/29/05. Pull through signage on southbound Interstate 475 at U.S. 80 & Georgia 22 (Exit 3) simply references Interstate 75 south Valdosta, Tampa. Photo taken 05/28/05. Interstate 475 plies across wetland areas associated with Tobesofkee Creek to split into side by side wye interchanges with both the Interstate 75 mainline and a distributor roadway (Exit 1) to Hartley Bridge Road. Photo taken 11/07/14. Three lanes proceed onto Interstate 75 south toward Warner Robins and Perry while Exit 1 departs to Hartley Bridge Road for Skipperton and adjacent rural areas of south Macon – Bibb County. Photo taken 11/07/14. This shield assembly formally recognizes the transition of Interstate 475 south onto I-75. Photo taken 11/07/14. End shields line both sides of Interstate 475 as travelers continue south onto an eight lane freeway to Sardis Church Road (Exit 153). Photo taken 11/07/14. Prior to the upgrades completed in 2009, the Hartley Bridge Road off-ramp departed one half mile beyond the merge of I-475 onto I-75, resulting in a weaving traffic pattern. Photo taken 05/28/05. A single wye interchange facilitated movements onto Interstate 75 south from Interstate 475 prior to 2006. Photo taken by Chris Patriarca (07/06/03). Drivers joined Interstate 75 south after this end shield. Photo taken by Chris Patriarca (07/06/03). Interstate 75 north expands to five overall lanes from the Sardis Church Road on-ramp to the split with Interstate 475 (Exit 156). Photo taken 10/22/15. Passing under Hartley Bridge Road, four lanes of Interstate 75 progress north to the partition with I-475. Two ramps from Hartley Bridge Road accompany the I-75 mainline along a distributor roadway to both freeways as well. Photo taken 07/02/14. 70 mile per hour speed limits are maintained on the mostly rural Macon Bypass while Interstate 75 sees a reduced speed limit to 55 mph. The western terminus of Interstate 16 is nine miles to the northeast near Downtown Macon. Photo taken 07/02/14. Three lanes serve both Interstate 475 north toward Atlanta and Interstate 75 north to Macon and I-16. Single lane ramps merge onto the respective freeways from the adjacent Hartley Bridge Road distributor roadway nearby. Photo taken 07/02/14. For photos covering the Hartley Bridge Road connection, see Interstate 75 North – Cordele to Macon on AARoads. All signs for Interstate 75 and 475 throughout the Macon metropolitan area were replaced with the 1999 Georgia Department of Transportation exit renumbering project, including this two-mile diagrammatic sign south of Hartley Bridge Road (Exit 155). The Sardis Church Road interchange had not been built at this point. Photo taken 05/28/05. Now one mile south of the Interstate 75/475 split of Interstate 75 northbound, this guide sign was removed sometime between 2003 and 2005 in conjunction with construction to upgrade the Hartley Bridge Road exit into a parclo interchange. Photo taken by Chris Patriarca (07/06/03). A third diagrammatic overhead assembly for the Interstate 75/475 split. 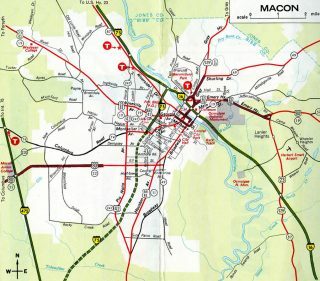 Traffic continuing into Macon will reach the city limits in four miles at U.S. 41 and Georgia 247 (Exit 160A). Photo taken 05/28/05. Entering the original single wye interchange where Interstate 475 begins. Traffic taking the Macon bypass rejoins I-75 by milepost 177. Photo taken 05/28/05. Confirming markers for Interstate 475 stand just beyond the separation from I-75 along the freeway northbound. Photo taken 06/30/17. “10 events that shaped our region.” Macon Telegraph, September 30, 2012. “Bibb Road Contracts Awarded for $83M – Deal for New Southern Interchange between Interstates 75 and 475.” Macon Telegraph, August 20, 2006. Page updated July 5, 2017.